Hello everyone. I have been meaning to build an efficient setup that runs throughout the night. I think it would generally sit idle since it would only run downloads, so idle state is of importance to me. I have been looking at cheap embedded ULV mobos and I found one with a Celeron 1037u cpu. I was planning to use components laying around with it: a 3.5" 160gb sata drive, an external hdd, power it with a 350w psu that's not 80+ rated, and nothing else. This probably won't be the most efficient but it keeps costs to a minimum. I also have an Asus laptop that runs an i3 370m. It features Super Hybrid Engine (SHE) that reduces the frequency to about 900MHz and multiplier to x7 according to Cpuz. According to HWM Blackbox it runs at 1100MHz with x9 multiplier which was puzzling but it also displayed the power consumption at 5.71 watts (guessing only for cpu). Not sure if this is accurate and whether such programs are capable of measuring consumption (please share if there are any). Sadly I don't own a Kill-a-what to measure exact total consumption. I would connect an external hdd to laptop if I used it. It's nice that this Ivy Bridge Celeron 1037u (17w) is 22nm, has 3d transistors and etc. Would you guys say that this setup would consume at least 15w or up to 25w at idle? Does anyone have actual measurements they can share? The Arrandale i3 370m (35w) is 32nm but SHE underclocks it significantly. With wifi, bluetooth, lcd, etc turned off I have a feeling it would consume less than 20w (maybe even below 15w?). I don't imagine your i3 draws all that much power. We use an HP laptop with an i3 as a HTPC, works great for Netflix or to stream from the home server. Actually if you use a desktop as a home server you would not need an external drive, just stream straight from the server. I have a Kill-a-Watt and I'll measure the laptop in a bit. Honestly, idle wattage has more to do with your choice of things like your power supply, motherboard, RAM, etc rather than your CPU. Today's CPUs power down pretty darn well, even AMD APU's. If you want to build yourself a very low wattage computer at idle, pick an efficient power supply, a small motherboard form factor with few extras, 1.35v memory, and your CPU of choice. Even a 4770k will idle pretty low. Didn't Intel simply drop all it's Haswell power saving magic for its desktop stuff? Point being, laptops are designed to be power efficient, and even more so Arm based stuff, but not enthusiast grade parts that run hot and inefficient, because it's the users who foot the electric bill. The story about Asus boards comes to mind, when thy claimed to use some kind of power switching/saving, even though the only thing they changed was the product carton. Also nowerdays with faster RAM, PCI and USB, mainboards may actually have gotten more power hungry. I suspect laptop power supplies by virtue of being of smaller max wattage also can handle tiny idle loads much more efficiently, even though they are traditionally cheap buzzing pieces of engineering. I've yet to build a custom office type system, significantly below 40W (idle). Meanwhile Intel's factory built NUC claims to idle at 7 Watts, off the wall! Lakedude, thanks for looking into that. When you do test, if you didn't mind, could you please try to disable what you can at power saver setting? Your cpu may also end up a bit higher clocked at idle. Regardless, it will be nice to have a general idea about idle consumption. I have run my desktop all night in the past. It's a FX-6300 (four cores disabled from bios) with a hd4650 among bunch of other stuff (tuner, sound card, etc) in it powered by 600w 80+ bronze psu. From info I saw out there, it probably consumes above 50w at idle. I only plan on running it for downloads and nothing else which is why I need the external hdd attached. Ventanni, I agree with your point. I acknowledged the psu that I intend to use not helping my cause. I would only use a stick of 1.5v so-dimm in the system and two hdds (all of which I already own). Not really low power parts but it's what I have laying around. All new cpus probably have between 5-10w difference at idle, maybe closer to 5w? One of my dilemmas is how that inefficient psu will effect the idle consumption. How much will it increase the drain? Know of fence, I suspect the laptop psu handles low idles better than regular psu too. Don't think they have come out with embedded Haswell ULVs, still waiting on new Atoms. The NUCs are pricey, and buying all efficient parts that Ventanni rightfully suggested would cost close to a cheap desktop setup. I am on a tight budget, so I prefer spending 100 bucks for the mobo I need to build the system. The 1037u being a 3rd gen ULV should be considerably more efficient than 1st gen mobile i3 at idle. I wonder how much that 350w psu ruins the efficiency of 1037u compared to an underclocked 1st gen i3 both running at idle? Could my old underclocked i3 laptop consume close to or less than the 1037u setup? According to the Kill-a-Watt our HP laptop with an i3-2350m (32nm, Sandy Bridge, dual core with HT, 2.3GHz) draws about 12 watts @ idle just maintaining a desktop with nothing special going on. That is with the cover shut so the video goes to the TV. I don't think the built in display stays on when the lid is shut. When streaming Netflix it bounces around a bit usually staying between 27 to 30 watts but with swings as high as 34 and lows as low as 24. I'm certain this could be improved upon with a two generations newer Haswell CPU based system but I'm not sure it would be worth spending much money on. 12 watts is going to cost like 3 cents a day if you left the machine on 24 hours straight and you need the waste heat in the winter anyhow. Sorry I didn't see your note about reduced power states. I'm sure the system will pull less power in some kind of standby mode. Your CPU is one generation older than mine but both are on the 32nm process. I'm guessing that your system will draw just a hair more power but should be in the same ballpark. Both are 35 watt TDP parts but neither will draw that much at idle or while streaming NetFlix. It's a FX-6300 (four cores disabled from bios) with a hd4650 among bunch of other stuff (tuner, sound card, etc) in it powered by 600w 80+ bronze psu. From info I saw out there, it probably consumes above 50w at idle. I only plan on running it for downloads and nothing else which is why I need the external hdd attached. Its all about the platform more or less. Buying a super efficieny idle CPU will not change anything. No need to buy S or T variants either. Buying laptop style parts will have a small impact too. You want LGA11xx or AMDs FMx series. Then you can more or less buy any CPU you want. However it also depends on what else you got. A GPU adds alot of idle power usage compared to IGP etc. Some motherboards on the same socket can use up to 20-30W more idle than the lowest. 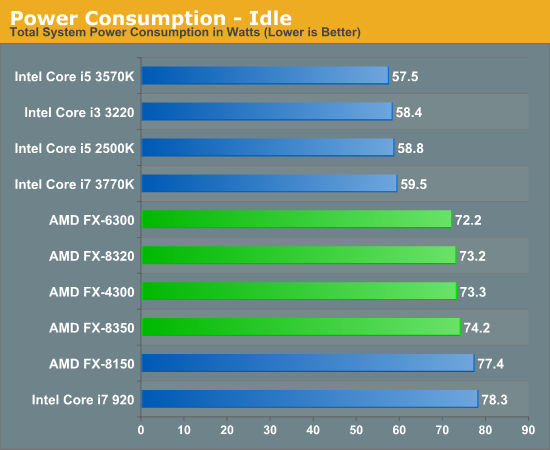 Haswell will idle even lower than any of these above. Disabling cores got no effect as such as you can see above. Simply buy a cheap H81 board+Haswell Celeron/Pentium and use the IGP. And you are about the lowest consumption you get. Moving from a bronze rated to gold rated PSU dropped my power consumption from 85W typical to 63W typical (this includes modem, telephone, router, etc. that are also powered by this PSU). PSU efficiency has a huge impact on actual power consumption, especially in the idle power segment where the PSU is non-optimally loaded anyway. Point: don't skimp on the PSU, buy lowest wattage possible. Edit: since you're only keeping it running for downloads, have you considered to simply use your router for the task? That one will definitely use the least of any other setup you may assemble. Any tomatoUSB capable router can be set up easily to do what you want, some even support such activities (depending on what you actually need) in stock firmware. Lakedude, thanks for taking time to look into that. It's alright, I appreciate the sentiment (about sorry). I am impressed with the measurements. I agree with the points you have made. I can probably draw about that or maybe less when I turn off features like wifi, lcd, etc and enable that SHE feature. The 3 cent figure probably for the US, right? It's probably quite higher in Eastern Europe where I am at the moment. ShintaiDK, I have probably seen that graph before. That's why I have had the general idea it probably uses over 50w at idle. The cpu would use the most power in the itx setup, as the hdds use about 1-2w (you probably know this too). Was planning on using the igpu in that setup. Velis, from previous reivews/benchmarks I had the impression the ratings didn't make the biggest difference. Perhaps I show go back and look into it further. Those numbers are impressive. I had that general view about psu idle efficiency, just didn't have numbers to go on. I have never ventured to flashing routers though I have been meaning to at some point. You guys have confirmed my suspicion about that psu ruining efficiency on the mini-itx setup. It doesn't seem worth shelling out money for that itx mobo when I can achieve as good or better efficiency on my older laptop. Will try to get my hands on a kill-a-watt in the near future and take some measurements. Would like to post the numbers for those who would be interested. Thanks to everyone who took time to contribute to the thread or just peeked. Well I beg to disagree. Do you have a power meter (I do)? Back when I was single I had over dozen computers and I used the meter to measure a few and I was surprised at the results. Desktops draw more period. Using laptop style parts must save energy because the laptops draw less power, I know cause I measured. i3 laptop 12 watts at idle. Sizing a PS makes a big difference as they tend to be most efficient in the middle of their rated power range, falling off at the ends (a bit like a bell curve). I do have one yes. You also compare apple and oranges. Take 2 miniITX boards and same config for the rest of the system for both. One using a mobile Celeron U for example. The other a random Haswell Celeron/Pentium. Measure both and you find a minimalistic difference at best in idle. For reference, my system idles at around 40-45W. yup. intel's power gating is so good that number of cores doesn't impact idle. you're going to see more variation from different motherboards being used than you are from different CPUs of the same generation from intel. AMD's is pretty good these days as well. A lot of idle power depends on the motherboard design. In general, desktop motherboards don't spend a lot of resources optimizing for idle. Consumers tend to go for the more fully featured boards and they'll throw in as many features as practical at a given price point, which tends to up the idle requirements. Having things like PCI slots (vs. PCIe) or 10+ USB headers or PS/2 keyboard connections and all that kind of stuff that people expect in a desktop mobo, but can be left off a laptop adds up. Plus power supplies made for 400W loads rather than 50-80W loads means power is often out of efficiency range. In all likelihood, your laptop is close to and possibly better than the power consumption you'd get from your planned build, even though it's several generations newer. If your laptop has the adequate connections and performance to suit your needs, then I'd use it. One of us is missing something. The OP is comparing an i3 laptop to a new build and asking if the new build would be worth it to save power, correct? Maybe you have a different understanding? IMO building is not worth it because his laptop is already sipping very little power in the first place. Now I'm just guessing because my laptop is one generation newer but spending a few hundred to save a tiny amout of power is not worth it. Did I misunderstand the OP's question? No lakedude, you are on point. Some have made other general points that are good and valid but may not apply to my situation as much. Regardless I appreciate everybody's input and contribution. Well, if you don't need the laptop for anything else it's obviously the best solution. I'm guessing SHE is some kind of Asus energy-saving thingie? I bet it doesn't matter much at idle because as mentioned modern cpu's already power down almost completely anyway. CPUID HW monitor and HwInfo both show cpu power draw too. I'm not sure how accurate they are, but you could use them to compare between SHE enabled and disabled. Now it's possible to built a desktop system that is as power efficient as a laptop but you will need a pico psu and a good power brick. You could sell the laptop to fund for parts but it seems like a lot of work for basically no real benefit. Make sure you enable C6 in the bios, that's the one for the power gating. This has a much larger effect than any speedstep/powernow stuff. Infact, I don't even enable powernow on my APU anymore, just C6 along with an undervolt (idles around 60W with a 7870 in the system). Also i've noticed with my asus motherboard if I set everything to auto and enable their special EPU energy mode it shaves a few more watts off compared to gigabyte and asrock with the same chipsets/cpus. I'm not sure what asus does but it was noticeable (I think they drop the voltage down to like 0.8v when idle if i'm remembering right). If your "server" only needs to store x86 data for downloads or uploads and not execute that data, you could go for an ARM cpu based setup. You could use a raspberry pi if that is fast enough. You would be talking about a few watts. Is ~65C for an A8-6500 at idle normal? Is anyone interested in seeing comparisons between a 4790K and a 9700K?